Enjoy exceptionally aromatic, great tasting coffee and skip the coffee house prices. When making any type of coffee drink, from simple drip to espresso and cappuccino, grinding beans right before brewing is a must for any true coffee lover. And it's easy with the Aicok coffee grinder. CHARACTERISTICS: 304 stailess steel grinding bowl and blades the body of ABS material without BPA. 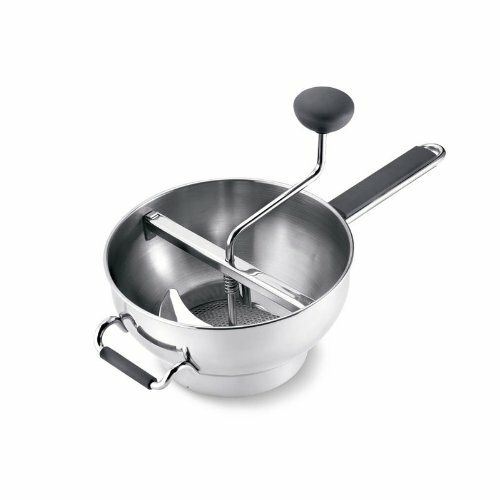 Clear lid allows you to control the grinding process at any time. 150W, 25000-28000 rpm/min coffee beans grind the engine within 20 seconds. Press to work and release to stop, the simple button makes your cooking life easier and safer. THE FOUR PRINCIPLES OF GRINDING: The degree of grinding suitable for the brewing method should be selected; The temperature generated during grinding is low; The powder after grinding should be uniform; Grind before brewing. 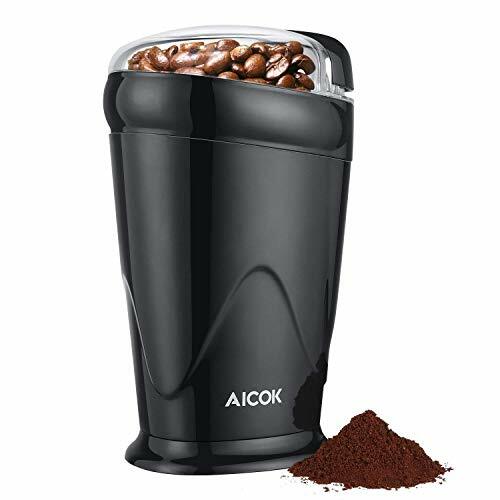 The Aicok grinder can meet all needs. TIPS: 1. Hold the button down for a few seconds for finely ground, shake it during grinding or pulse it 3 or times for more coarse bean. 2. Do not use this unit continuously for more than 30 seconds. 3. Do not immerse the motorized base in a liquid or dishwasher. SPECIFICATIONS: Wattage: 150 Watts Capacity: 3 oz Material: S.S 301 / AS + Inox 304 Rotation: 25000-28000 rpm Size: 110 * 103 * 186 mm CLEANING AND CARE 1. Always remove the power plug from the wall socket before cleaning. 2. Clean the transparent lid by hand. Don't place in the dishwasher. 3. Clean the grinding chamber with a small brush and wipe the grinder with a wet cloth only. Hold the button down for a few seconds for finely ground or pulse it 3 or 4 times for a more coarse bean. PERFECT FINENESS BLADE GRINDER - Specially designed triangle basket, works well to grind coffee bean to your liking. You could grind spices to near dust size to use for cooking. The design and solid construction grinder works like a champ. POWERFUL ELECTRIC BLADE GRINDER - Double stainless steel blades allows you to decide the coarseness of grounds. 8 seconds for french press coffee, 10 seconds for Mocha or up to 20 seconds for finely powdered espresso. 150W powerful motor, 25000~28000 RPM/MIN. MULTI SPICE GRINDER - Grind coffee beans, spices, nuts, seeds herbs, linseed, pumpkin seeds and more. Using the button puts you in control to the finished grind. 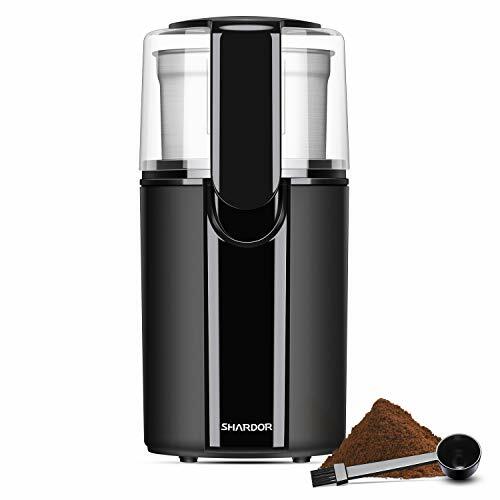 LARGE CAPACITY COFFEE BEAN GRINDER - Yields up to 12 cups of coffee. 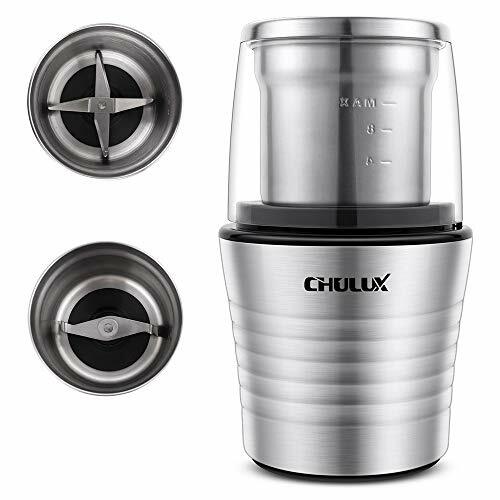 It grinds coffee beans up to 60g at a time for 12 cups coffee. Design is sleek and easily stored without taking up much space. ONE TOUCH SAFE OPERATION - Safety switch will keep the grinder safe as the grinder will only operate when the top cover is safely in place. Easy to use with the one-touch operation. 2 year warranty on this grinder, risk-free. Just by simply pressing the lid with different time to custom grind settings. Get coarse or fine coffee powder in 20 seconds or less for cold brew coffee, French Press, Pour over,Moka pot, Espresso. High-quality stainless steel blade and 200W powerful motor ensure continuous and even grinding for better maintaining the original rich aroma and oil of the coffee bean. Electric coffee grinder and spice grinder for coffee bean, spices and nuts; Build-in smart overheat protection, extends motor lifespan; Safety-lock lid, safety switch; Stainless steel blade and stainless steel exterior; Stainless steel removable bowl, one grinder bowl and one chopper bowl; Cord wrap base. 1-Year Manufacture s warranty. Also works great with nuts coffee, herbs, spices, seeds, etc. 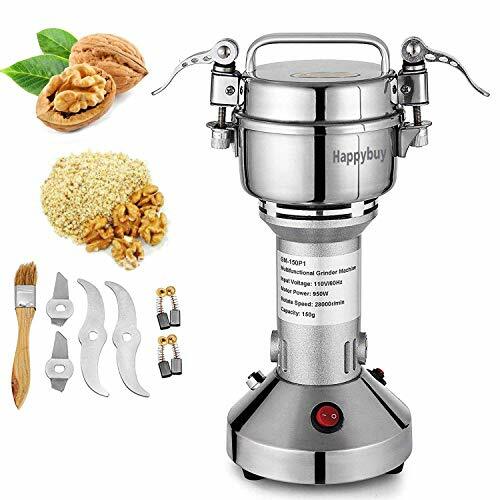 Adjustable grinding mechanism for different types of grain, such as corn, wheat, and oats, Also works great with nuts coffee, herbs, spices, seeds, etc. Cook s Illustrated Recommended Winner! 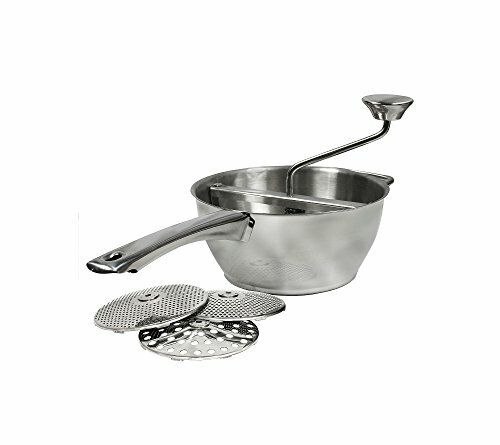 With a simple turn of the ergonomic, non-slip handle this durable stainless steel food mill purees a wide variety of fruit and vegetables while straining out skins, seeds and pulp. Instead of manually scraping the underside of the mill, the innovative scraper automatically scrapes as you turn. This increases efficiently by allowing a smoother, more continuous flow of food. 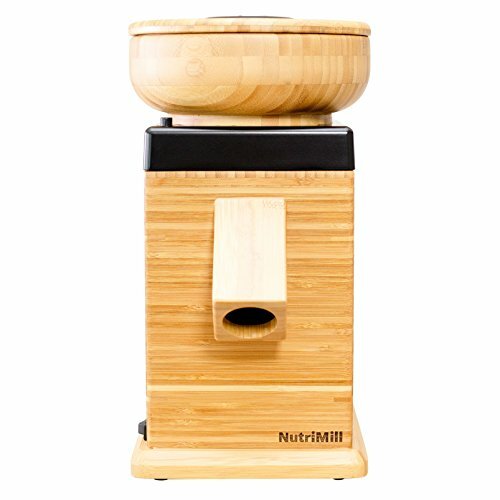 The deluxe food mill also sits high in you pot or bowl keeping the mill out of the food. Comes with 3 different size straining disks; 2mm, 3mm; 4mm. Comes part for easy cleaning. 1. This machine is suitable for grinding bean curd, starch, rice flour, corn and used in other food industries. 2. It can grind wheat, rice, corn, sorghum, soybeans and other crops into dry powder. 3. Especially, it is also suitable to grind soaked soybeans and rice into pulp,can make soybean milk,rice cake and other foods.At the same time, it can be used for crushing feed. 3. All-round fine crushing, open the door of health. Note:The weight of the grinder is about 50lbs/23KG. Supporting power: 1500W;Voltage of the motor: 220V;Rated speed: 1400r / min;Drill diameter: 150mm. Heritage of traditional mill, innovative steel mill technology. All-round fine crushing, open the door of health. Capacitor shell is made of iron galvanized material, the transport process will not be crushed, put an end to rust. This machine is suitable for grinding bean curd, starch, rice flour, corn and used in other food industries. 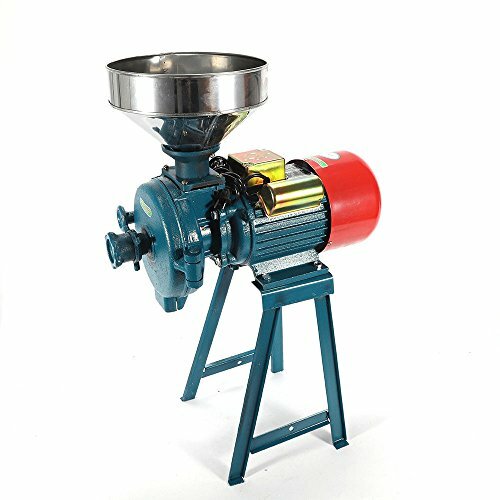 It can grind wheat, rice, corn, sorghum, soybeans and other crops into dry powder.At the same time, it can be used for crushing feed. 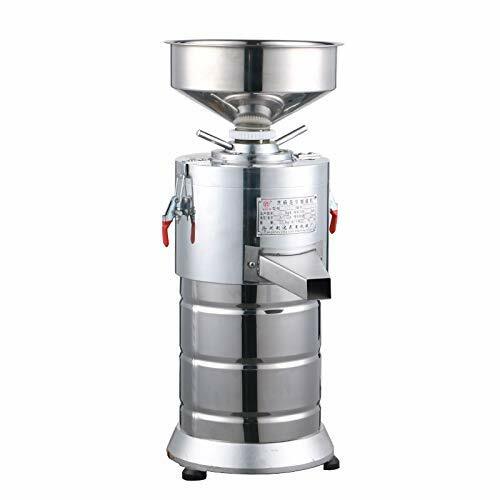 The CHARD Grain Mill allows you to grind corn, multi-grain, soybeans or shelled nuts. Create delicious and authentic breads and baked goods, made from scratch. 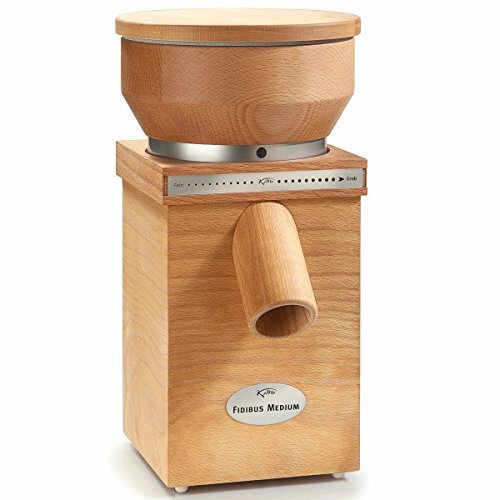 This grain mill is perfect for high quality natural baking, gourmet cooking and serious home beer brewing. Made of durable tin-coated cast iron for years of continuous use. The adjustable grinding plates allow a grind from coarse to fine. Features an extra-large capacity hopper for bigger batches which ensures extended milling between refills. The long-lasting poly handle won't split or splinter like wood and allows for simple and easy continuous operation. The strong and secure adjustable clamp-on style easily attaches to any countertop up to 1 1/2 Inch thick. Perform tasks faster, disassembles for quick and easy clean-up. CHARD Products put you in control with a little help from the right tools. From meat processing, to outdoor cooking, to simple food preparation, we help you Make It Yours. 1: The grinder is characterized as beautifully-designed, small in size, light, highly-efficient, easy to operate. 3: The grinder can deal with wide-range different sorts of materials, such as grains Hide gelatin milk vetch E-gelation, olibanum, root of membranous milk vetch pseudo-ginseng sea horse seed of Chinese dodder glossy ganoderma licorice, peral and ect.The material will not be wasted and the colors and flavors of different material will not be mingled together. note we have two model 110v or 220v (optional), by default, we will ship according to the voltage of your Country.If you need something different, please send us a message. Great Wall Instrumentsis a professional manufacturer of stainless steel high-speed grinder. we will provide to you the English Instruction and Professional Servicewhen you purchase from us. If you buy from others , you may not got our professional service and technical support. The grinder can deal with wide-range different sorts of materials, such as grains Hide gelatin milk vetch E-gelation, olibanum, root of membranous milk vetch pseudo-ginseng sea horse seed of Chinese dodder glossy ganoderma licorice, peral and ect.The material will not be wasted and the colors and flavors of different material will not be mingled together. 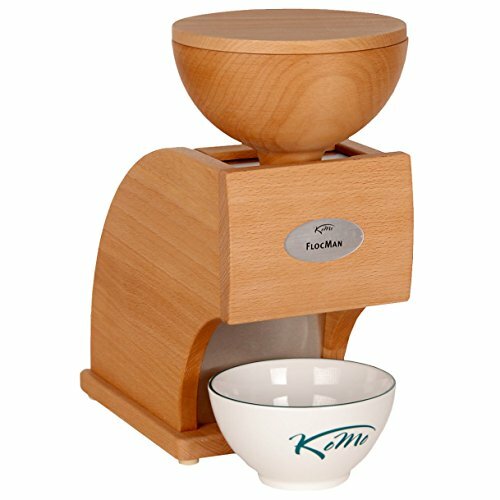 KoMo's Fidibus 21 grain mill is compact but powerful. At just over a foot tall, the Fidibus 21 performs well against larger mills. Inside its attractive beechwood veneer cabinet are a set of advanced corundum-ceramic burrs and a strong, high efficiency motor with the torque and stamina needed for grinding grain. The solid beechwood hopper holds 1 lb., 15 oz. of grain, enough for over two pounds of whole grain bread. The mill produces 5-6 oz. of flour per minute for bread flour texture, and can run continuously so you can refill and keep grinding for any quantity of flour you need. Its compact footprint makes it ideal for a smaller kitchen, a valuable tool for anyone exploring the joys of cooking with natural foods. KoMo's FlocMan Grain Flaker has all the qualities needed for a solid, long-term relationship. It's peacefully quiet, easy to maintain, and perfectly reliable to say nothing of its good looks! Oats are a naturally soft grain and more of our customers roll oats than any other grain in their FlocMan but many other grains including wheat, rye, barley and millet can be flaked too, with a little preparation. These grains are normally dry and hard. To soften them, hold them under running water briefly in a strainer. Then spread the grains on a cloth or towel to let them dry over night or for at least 3-4 hours. This time will vary depending on the grain used, but a little experimentation will help optimize the process. The softened grain will flatten nicely into flakes, similar to commercially available rolled oats. At the same time this contact with water starts an enzymatic process which makes it easier for your metabolism to assimilate the minerals in the grain. The "Plus" is the newest and most advanced grain mill in the NutriMill lineup. 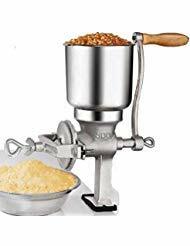 It grinds all grains, legumes, corns, rices into fresh, nutritious flour. 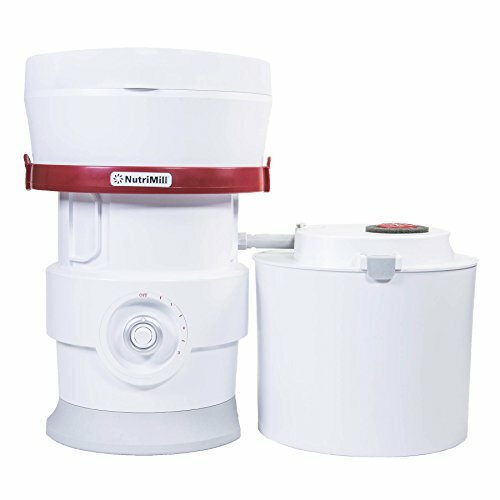 The NutriMill Plus' self-cleaing Micronizing Chamber is surrounded by a re-engineered muffling barrier and sound insulation to ensure quiet milling. The patent pending filtration system uses a dual cyclo cup, canister chamber, and diffusing filter for a cleaner milling experience. The NutriMill Plus uses a 2 speed motor and texture control switch so you can easily choose between ultra fine to coarse flour with every batch. The grain feed design allows you to turn the unit off anytime during the milling process without damaging the motor or milling heads. It is designed and assembled in the USA for advanced performance and includes a Limited Lifetime Warranty. Mill Fresh Flour Directly Into the Canister or Into Freezer Safe Bags. Flour Bagger Accessory and Extra Bags are Included. Bottom Vent : The cooling vents could avoid the item from damaged during high speed operation. Pour out the crushed raw material. The grinder can deal with wide-range sorts of materials, such as grains Hide gelatin milk vetch E-gelation, olibanum, root of membranous milk vetch pseudo-ginseng sea horse seed of Chinese dodder glossy ganoderma licorice, peral and ect. The materials should keep dry, no moisture and grease. Do not operate the machine continuously for a long time, you are suggested to use in interval. Do not clean the machine with water, it's better to clean by cloth or brush. We provide one year warranty. Please feel free to contact us if you have any question. Wish you have a good shopping experience. ZT-300, Capacity : 300g Power : 1500w Speed : 28000r/min;Suitable for grinding no more that 300g. No dust when working, no vibration. 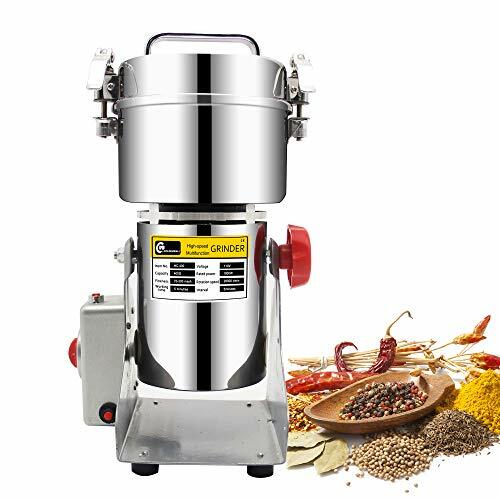 Highly efficient and power-saving, this is a commercial use ready kitchen mill grain grinder. Use it in your restaurant, hotel, bar, food store. Alternatively, use at home to grind like a pro! The rough, potent & fine power, makes the grinder reliable for grinding wide-range different sorts of grains and materials. Small, light & compact design, very easy to clean and maintain. With its efficient design & high quality built, the mail grinder will keep all the vitamins and nutrition in every batch of grain. We provide one year warranty. Great customer support with a flexible refund policy. IF YOU HAVE ANY QUESTION, PLZ CONTACT US! This machine is suitable for grinding bean curd, starch, rice flour, corn and used in other food industries. It can grind wheat, rice, corn, sorghum, soybeans and other crops into dry powder. At the same time, it can be used for crushing feed. Note: The Corn Grain Rice Wheat Cereals milled from this machine is human edible. All-round fine crushing, open the door of health. Supporting power: 1500W;Voltage of the motor: 110V;Rated speed: 1400r / min;Drill diameter: 150mm. 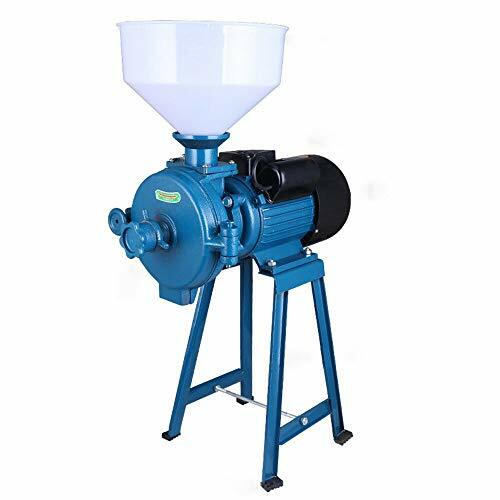 After you grind soaked soybeans and rice into pulp,you must clean the machine and dry it.Otherwise,this machine is very easy to rust.So we don't suggest wet grind. 1 - It is better not to wash the grinding parts of the machine. If you must wash it, you must wait until it is completely dry before using it again. 2 - The grinding disc has been calibrated to the best position when it leaves the factory. Please do not disassemble it. Otherwise, it will affect the effect of sauce grinding because of uneven position. 3 - When starting the machine, please first turn down the grinding accuracy to ensure that there is no any contact between the grinding disc. Then you can slowly increase the grinding accuracy until you hear the grinding sound. Please note that the accuracy can not be adjusted too fine, or it may burn the machine. 4 - Please choose high quality peanut or sesame with high oil content. Before grinding, please soak the raw materials in water for at least 10 minutes, and then put the raw materials in the pot with a small fire to evenly stir fry to the expansion state, when the outer skin can be gently twisted open, take it out from the pot,cool grinding. The grinding machine is widely used to grind sesame and peanut butter, etc. 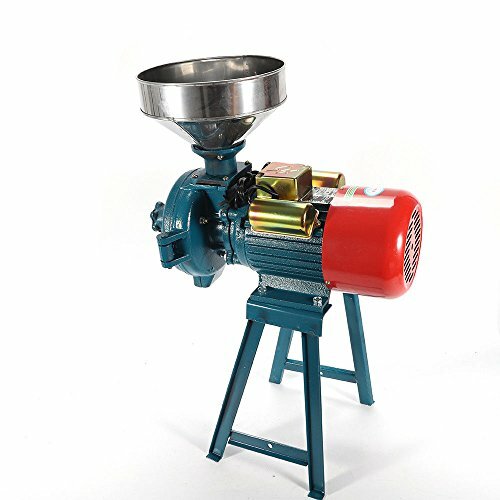 Professional Peanut Butter Maker Machine - The grinding machine is widely used to grind sesame and peanut butter, etc. Advantages - Electricity-saving, small size, light weight, highly-efficient, easy to operate. SPECS - Voltage:220V/50Hz; Power:1100W; Speed: 2400r/min; Output:15kg/h; Weight:23kg; Dimension:4.7 X 4.7X 9.8. Material - The Professional Peanut Butter Maker Machine is made of high strength stainless steel . It has good wear resistance and corrosion resistance so that the processed materials are free from contamination. Before using the device, please don't make the screw of grinding blades too tight, too tight will damage the blades. This machine can only accept dry grinding instead of Wet grinding. Heritage of traditional mill, innovative steel mill technology;All-round fine crushing, open the door of health. It can grind wheat, rice, corn, sorghum, soybeans and other crops into dry powder. 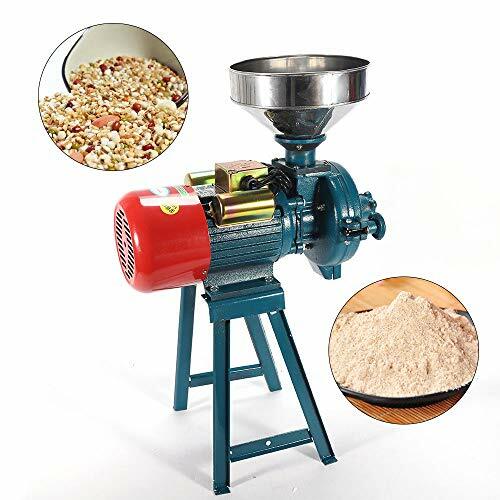 Especially, it is also suitable to grind soaked soybeans and rice into pulp,can make soybean milk,rice cake and other foods.At the same time, it can be used for crushing feed. The smashing materials is not exceed half of the smashing groove. The smashing meterials should keep dry, no moisture and grease. When it starts up,please shut off the power supply immediatel. Usually smash the hard medicines into powder for a minute. Do not continuously operate the machine for a long time, you can use this machine in interval. Do not clean the machine with water, you can clean the machine by cloth or brush. During using, do not open the upper cover or put your hands. This machine adopts ultra high-speed motor, can quickly smash all kinds of dehydrated food, rice, corn, sesame, soybean, fish feed, pepper, medicine (such as ganoderma, licorice, pearl etc), usually smash the medicine into the powder for no more than a minute. This machine is suitable for dispensary, medicine processing factory and powder processing. The mill grinder is characterized as beautifully-designed, small in size, light, highly-efficient, easy to operate. 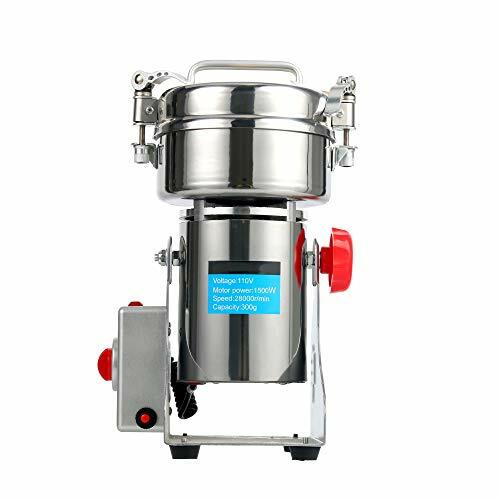 This electric grain mill powder machine is suitable for dispensary, medicine processing factory and powder processing. 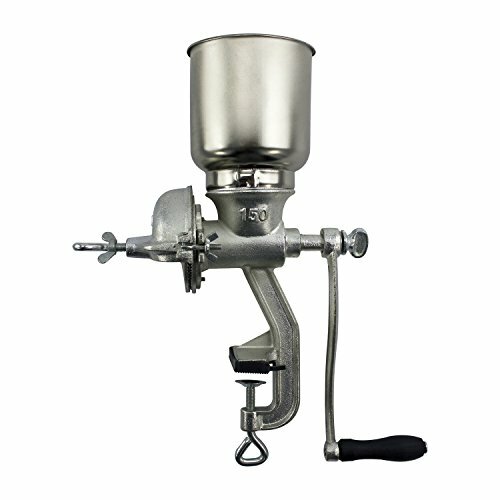 The flour grinder is usually used to grind various cereals and herbs, such as grains, milk vetch, pseudo-ginseng, sea horse, glossy ganoderma, licorice, peral and so on. Compare with similar items.